Since the third edition of Grieve's Modern Manual Therapy was published in 2005, the original concepts of manipulative therapy have grown to embrace new research-generated knowledge. Expansions in practice have adopted new evidence which include consideration of psychological or social moderators. 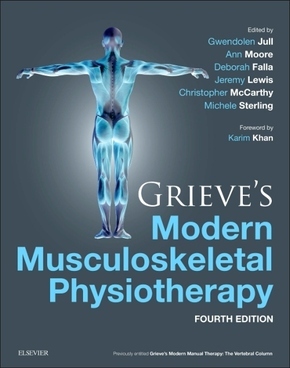 The original manual therapy or manipulative therapy approaches have transformed into musculoskeletal physiotherapy and this is recognized by the change in title for the new fourth edition - Grieve's Modern Musculoskeletal Physiotherapy . Grieve's Modern Musculoskeletal Physiotherapy continues to bring together the latest state-of-the-art research, from both clinical practice and the related basic sciences, which is most relevant to practitioners. The topics addressed and the contributing authors reflect the best and most clinically relevant contemporary work within the field of musculoskeletal physiotherapy. The book is divided into five parts containing multiple sections and chapters. The first part of the book looks at advances in the sciences underpinning musculoskeletal physiotherapy practice. Here there is commentary on topics such as movement, the interaction between pain and motor control as well as neuromuscular adaptations to exercise. Applied anatomical structure is covered in addition to the challenges of lifestyle and ageing. A new section highlights the important area of measurement and presents the scope of current and emerging measurements for investigating central and peripheral aspects relating to pain, function and morphological change. Another section discusses some contemporary research approaches such as quantitative and qualitative methods as well as translational research.